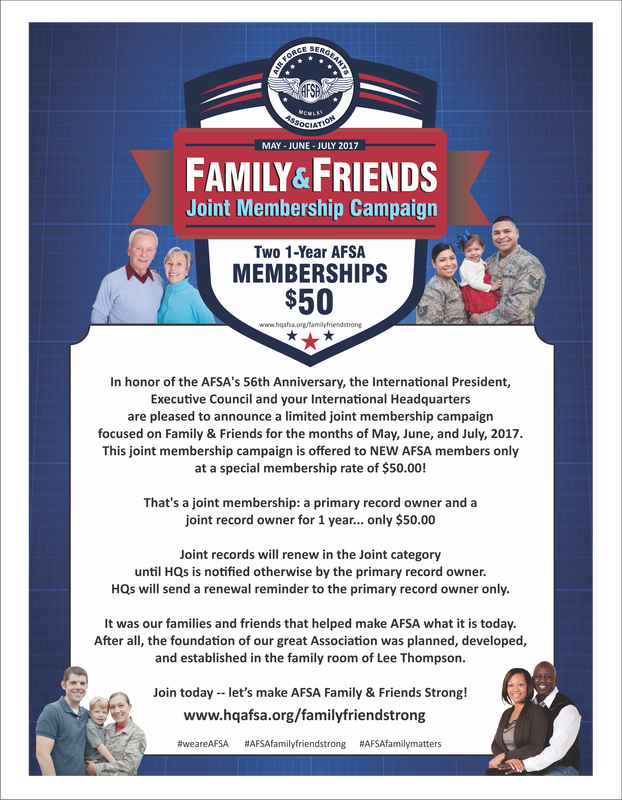 In honor of the AFSA's 56th Anniversary, the International President, Executive Council and your International Headquarters are pleased to announce a limited joint membership campaign focused on Family & Friends for the months of May, June, and July, 2017. ​It was our families and friends that helped make AFSA what it is today. and established in the family room of Lee Thompson. Step 1: Target new members only: Plan, schedule and host a special recruiting drive event that is appealing to people within your community, accessible to all, and mission based. Consider co-sponsoring special events within your local community to ensure a spotlight on AFSA and your active membership. Highlight local issues that will allow you to collaborate with other local groups, especially those with a different membership base. Display and share AFSA membership brochures, posters, “We are AFSA” selfies signs, banners, etc. Step 2: Ask visitors to complete the Family & Friends Membership Form (available to print, or complete online). Encourage them to join on the spot to receive the special discounted rate of two for $50. The person cannot be a current AFSA member. A joint membership can be two family members, two friends, an active/former/retired and family member, an active/former/retired and friend, two Active/former/retired members that are friends or family or any combination that wish to become joint members. Regular AFSA dues are $36 annually. within 30 days of your special events. ​Rewards: The top Chapter and Family & Friends Recruiters will receive special recognition at the 2017 AFSA International Convention and through our on-line and social media outlets. Share your Family & Friends recruiting success stories with AFSAComm and you may be featured through our online and social media outlets as well. Who is Eligible for Family & Friends Membership? A joint membership can be two family members, two friends, an active/former /retired and family member, an active/former/retired and friend, two Active/former/retired members that are friends or family or any combination that wish to become joint members. Someone who rejoins after two or more years of non-membership (an inactive member). Recruiters must use either the on-line joint membership webform, complete a printed version of the joint membership form (download below), or call HQ Member & Field directly. HQ will process the webform or mailed joint applications and populate the online record. HQ will process recruiter credit for both recruiter and chapter for the Primary Record only – no recruiter credit for the joint record will be applied. No rebates are offered with this special membership campaign. HQ will create two separate records – the primary record owner and the joint secondary member. HQ will bill the primary record owner only @ $50 renewal – 6 months after the join date. Campaign Dates: The AFSA Family & Friends Members campaign begins Tuesday, May 3, 2017 and ends Monday, July 31, 2017. 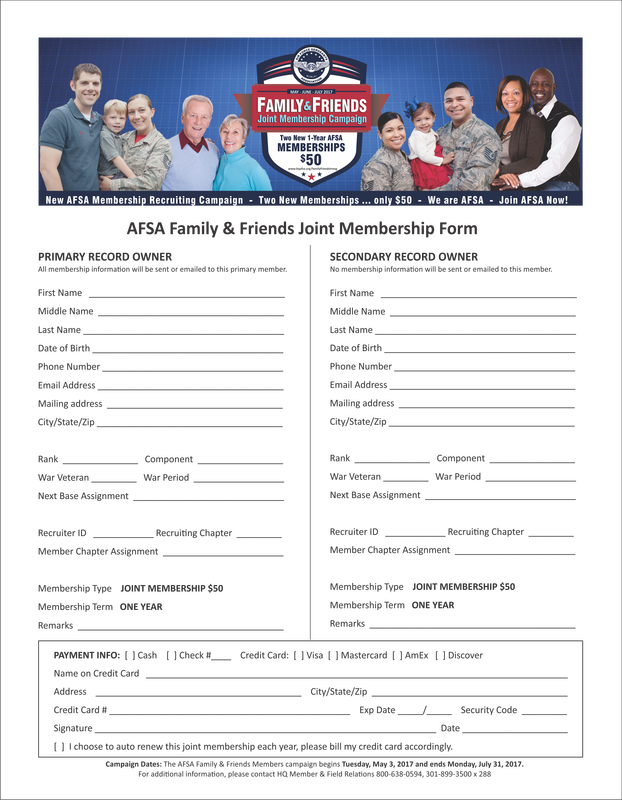 Download and print the AFSA Family & Friend ​Joint Membership Application here to print and bring to your special recruiting event. 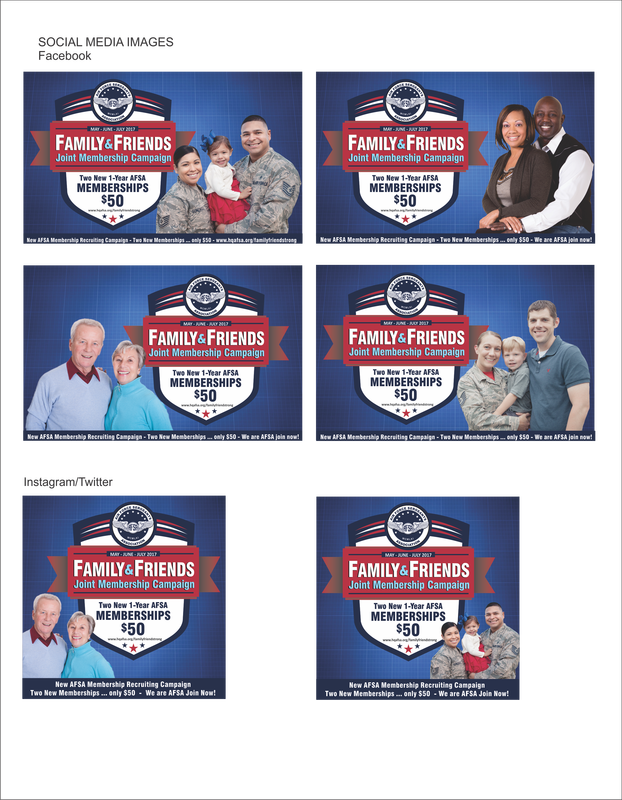 Download the AFSA Family & Friend Strong Social Media Images to post on your website and social media outlets.